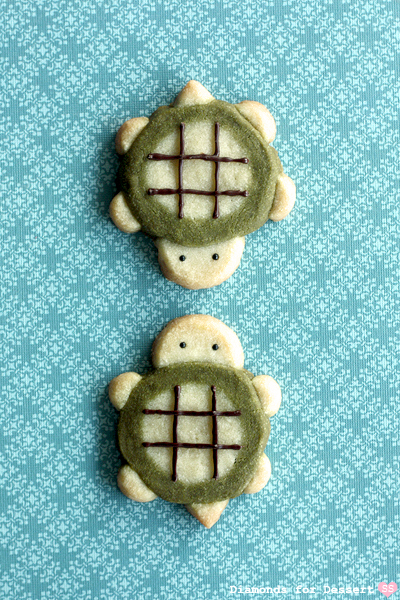 Here's the last in this series of animal cookies: turtle icebox cookies. The shaping starts off like the lion, but then a few more extra parts added. And, there's actually a little story behind these cookies. Way back in elementary school, my friends and I used to exchange little notes, written in glittery Gelly Roll pen on cute Sanrio stationery. (Remember the days of gel pen collections?) Anyway, each of us in the group had our own "signature" cartoon characters that we would draw on our letters. There were monkeys, cats, dolphins, dinosaurs, and, of course, my turtles. I didn't choose to draw turtles because I particularly liked turtles (because honestly, non-cartoon turtles aren't all that cute... sorry turtle lovers). The main reason was that I wasn't very good at drawing cartoons (even now, ask me to draw a realistic portrait and I can do it, but tell me to draw some sort of anime character and I'm like @_@). 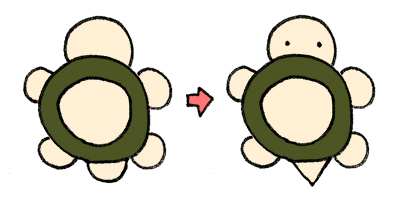 But, I found cartoon turtles relatively easy to draw, just a bunch of circles, dots, and lines. Which, more importantly, means that they adapt to icebox cookie form very well. 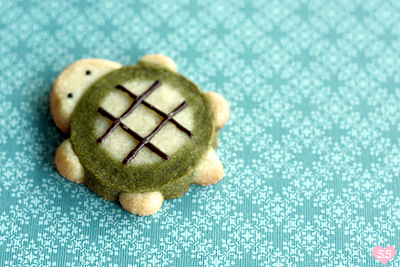 So I took my old turtle, spruced it up a little, and turned it into a cookie :). Make the vanilla icebox cookie dough until it says STOP (for modifications). Split the mixture that you have so far in thirds and set aside for now. Get two separate bowls. To one bowl, add 3/4 cup + 2 tbsp flour and 2 tbsp matcha powder. Mix thoroughly. Add one third of the previously split mixture and mix until you get a dough. To the other bowl, add 1 1/2 cups flour. 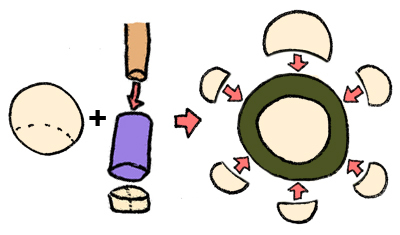 Add the remaining two thirds of the previously split mixture and mix. Now you should have one matcha cookie dough and one vanilla cookie dough. Split the vanilla dough in half. Place half of the vanilla dough on a piece of plastic wrap. Roll it so it forms a log with a 1 1/4" diameter. Sandwich the matcha dough between two sheets of plastic wrap. Use a rolling pin to roll it out to a rectangle as long as the vanilla log and wide enough to fully wrap around it (it'll be about 1/4" thick). Wrap the matcha dough around the vanilla dough log. Use your fingers to smooth out the crease formed. Cover the entire log in plastic wrap and refrigerate for 15 minutes. Once the dough is firm, remove from the refrigerator. Slice 1/4" thick slices from the dough log and place the cookies onto the baking sheets. Take the other half of the vanilla dough, sandwich it between plastic wrap, and roll it out to 1" thick. Use a round 1" cookie cutter to cut out circles from the dough. Take the cookie cutter and cut off part of the circle to form crescent shapes for the turtle heads. Use a big straw (like the ones for pearl milk tea) to cut out small circles. Use a knife to cut each circle in half. 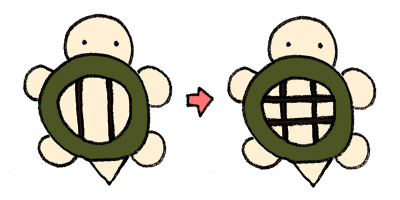 Now take 1 log slice, 1 crescent, and 5 small semicircles (4 for the feet and 1 for the tail) and stick them together to form a turtle. Preheat oven to 325°F. Line two baking sheets with parchment paper. Pinch the tail semicircles so it looks triangular. Add two black sprinkles on the crescent for the eyes. Repeat for the other log slices. 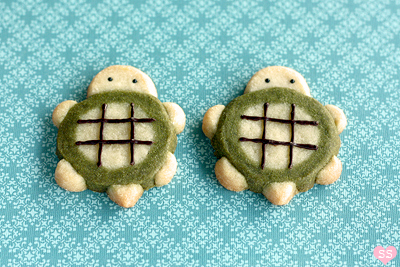 Chill cookie turtles for 10 minutes. Place in the oven to bake for 12-15 minutes. Let cool on the baking sheets for 3 minutes, then move the cookies to a cooling rack to finish cooling. Melt the chocolate. Place it in a piping bag. Pipe two vertical lines on the shell. Then, pipe two horizontal lines on the shell perpendicular to the vertical lines. soo cute! ive been waiting for this post since i saw a part of it in one of the penguin cookie photos! so very cute! you need to do more animals!! Michelle: That sounds fun :P.
sugarswings: I'll definitely try in the future! I'm sad to see the animal cookies go (for now) But I can't wait to see what's next. :) Will definitely try the penguin one. These are so adorable! And you've done them so uniformly! Great talent. These are totally cute overload! I'm making them the next time I need to impress people. heh. Holy freakin adorable batman! These are awesome! That's the cutest thing I've ever seen, and what makes it work is the photography, wonderful job. Ok I think I just squealed my house down. These are the most freaking adorable cookies EVER. 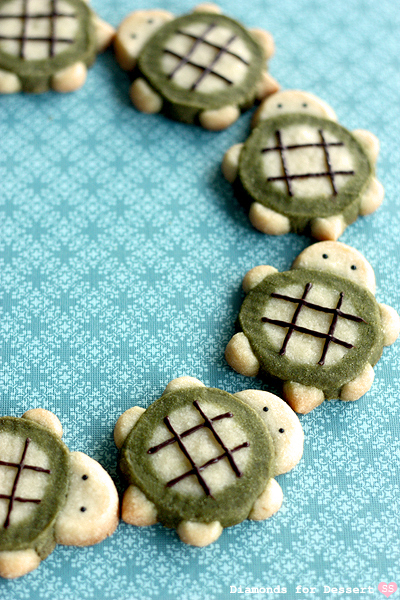 I'm so in love with these turtles that I don't think I can bring myself to eat them! Seriously, look at those cute little nub feet awwww! You are the undisputed queen of cookies. These are WAY cute. Every time I see amazing cookies it's YOU! I have to agree with Karen, you are the undisputed queen of cookies. wow....this is looking so cute, will surely try to make few on my kiddos bday ! I love making turtle shaped foods! I just made some turtle soft pretzels. 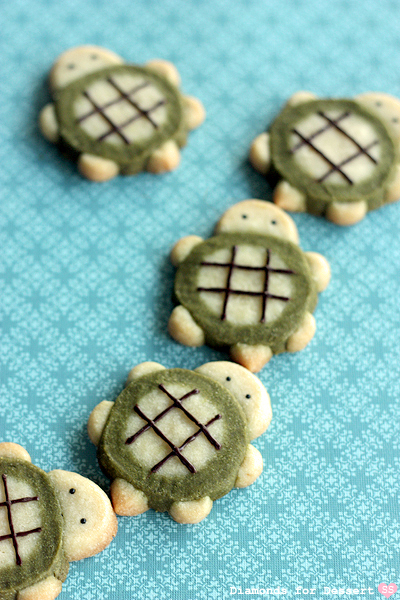 These turtle cookies are sooo cute. I'm definitely going to try making them. Jane, La Table de Nana, Joseph, Carolyn: Thank you! PURPLE-DEER: Aww, well they'll be back in the future :). Rainbow Sprinkles: Thanks! Having the main body as slices of a dough log definitely helps with the uniformity. musingsat: They certainly have a wow factor ;). Brilynn: Cool! I never see turtles in real life. Only if someone I know happens to have a pet turtle or something. Chuui: Thanks! With practice you can too :). Karen & Dionne: Cute :P. Glad you like them! Michelle: Yeah, totally. Gel pens and turtles. kirbie: Ooh, turtle pretzels, sounds cool! 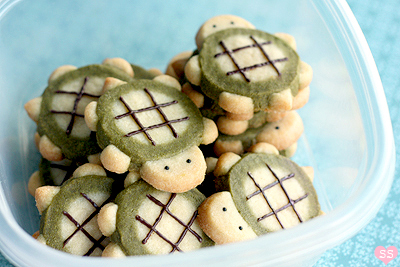 Yes, I seem to like making turtle shaped foods as well, like my turtle melon pan :). I admit it, I squealed! These are so adorable and they are so well done. Very impressive! Those look so freakin' good! I could eat fifty. Gimme gimme gimme! Wow! They are so adorable! and the idea is so cleaver! I have loved all of your animal ice box cookies. So darling! How can people say that they're JUST cute? They're LGKJAKLSJDLJKASD MAJORLY SUPERCALIFRAGILISTICEXPIALIDOCIOUS cute!!! hi! i love these little animals. so adorable. can i ask you how you made your banner? i see neat ones everywhere and can't seem to figure out how to make one for myself! this is soo adorable!!! Turtles are my favorite animal ever and just looking at this made my day! You did a great job! Love the photos :) and can't wait to bake them myself. where do you get matcha? i'm going to make the penguin ones this weekend, then tackle the turtles ones the week after :) can't wait! You're right you know, turtles aren't very cute. Many are downright ugly (bleh, snapping turtles). Tortoises, however...those guys are precious. My tortoise approves of these cookies. I asked him. Helen, livininthekitchen, Katie, Betsy, Sue, Mika: Thank you :). kk: Oh yes, Gelly Roll Pens. I actually still have a lot of mine (too many pens, not enough stuff to write). CABE: Thanks! 50, quite a lot :P! Anonymous: Haha. I'm impressed that you spelled "SUPERCALIFRAGILISTICEXPIALIDOCIOUS" correctly. I'm horrible at spelling. Nam: Frogs like Keroppi? :D. Now that I think about it, I think I agree with that. brittany ukulele: Thanks! The main banner with all the cartoon desserts? I drew the outline of the desserts by hand, scanned the sheet onto my computer, colored them on Photoshop, played around with the sizes, merged the layers on the bg colors, and then added the text. It'd probably be much quicker with a tablet, if you have one, so you could skip the scanning step. Vivian: Cool! I bought my matcha at a Chinese supermarket. I think it was in the tea section with all the other green teas. Most Chinese or Japanese supermarkets carry it. If not, there's always Amazon. P: Yay, glad to hear you're trying out the penguins! And the turtles. For the mixer, it'll depend on you (like budget, what you're using it for, etc), but I prefer a hand mixer b/c I only use a mixer when I'm whipping cream or eggs. Everything else I mix by hand (bread dough, cookie dough, etc.) I have a stand mixer but I pretty much only use it in extreme cases, like making marshmallows where I don't want the boiling syrup to burn me. Overall, I'd suggest a hand mixer b/c 1) they're way cheaper, 2) they take up less space, 3) I can use my own metal bowls (not constrained to the one that comes with the stand mixer which barely fits in my sink), and 4) I rarely use my stand mixer. I was actually planning on doing a sort of baking 101 series, which includes baking equipment in the near future :). anna: Haha, I know right? Well I mean there are some cute ones, but they can't compare with cartoon turtles :P. Cool, you have a tortoise! there are the cutest thing I have ever seen. I'm going to bake them very very soon. Can I pay you to make some for me?! Im afraid that mine won't come out as perfect or cute as yours!! Love them! i think turtles are cute, haha. Amazing ideas!!!!!! Monsters are jealous! I die. I can't believe I have only just found your blog right now. I recently made checkerboard cookies that I thought were so fab until I saw your incredibly cute cookies! Sorry, I couldn't find any directions to make a turtle one. This took me FOREVER!!! I should really make those cookies!!! These are so incredibly cute! I just made pandas! I need to make the penguins for my mom though, she loves penguins. This is adorable! I really wanna try this, but I was wondering if this would work with sugar cookie dough? Thanks! ediblecrafts, Alberta, Tara, Sara & Eva, justJENN: Thank you all! P: Glad my response was of help! I'm still planning out Baking 101 series, but I'm glad to know that you'd be interested in it. Jenny: Yay, try them out :). Anonymous: If you can't find matcha powder you can still make these. Instead, make the full vanilla icebox cookie recipe, split the dough into thirds. Keep 2 of the thirds plain, but take that last third and add green food coloring to it. Then you'll still have a white dough and a green dough to shape into turtles (there just won't be any match flavor). kasey: Glad the pasties recipe worked out! Dagmarette: Imperfect cookies can be cute too. It adds character :P.
tiffany: Haha, you would. You think frogs are cute :P.
Cake Story: Checkerboard cookies are pretty awesome nonetheless! Sarah: Ooh, cool. That must have taken forever to type out! But yes, try them out! Jess: Pandas! That sounds cute. Anonymous 2: It depends on what type of sugar cookie dough you're using. If it'll hold its shape during baking (that means no spreading) then it just might work. Better to try and fail than to sit around not knowing, right? In the end it'll still be delicious :). The Addicted Baker: Thanks! 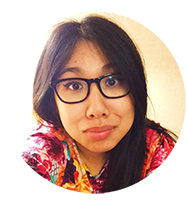 And welcome to the blog! The City I work for, Inverness, FL, actually has a festival every year in October centered around the water turtle called a cooter. And yes, we call it the Cooter Fest; but its all about the turtle. I think I'll be making these in October this year. Thanks for the cute idea. Very Cute! I adopted a teen many years ago ( now a grown man with his own family) who LOVED turtles. I might have to try m y hand at this and send it to him for his birthday. My first born is having a circus party at the end of the month so I might also try the lion one too. Christina: Thank you! Hehe, memories of youth. cookies and cups: Snoop all you want ;). KatieRae: That's adorable, "cooter" :D. What and interesting sounding festival, I think I'll need to google up on it, hehe. ErrerNavyWife: That sounds sweet. Thanks for sharing! ^^Tell me those aren't cute! I should make these; they seem like a good summer treat. Probably because of the name. Where do you get custard powder, anyway? Firstly, I want to say, these are ADORABLE!!! I love them! I want to make these for a birthday party but during the week I have a lot of work and studying and so forth to do and so I don't really have time to spare to bake. The party's on a Thursday so I was wondering how long the dough could last in the fridge so maybe I could try to squeeze some time in to bake then or if I baked them, how long they could last in the fridge or at room temperature. Thanks! icefox: OMG, the tiny turtle with the grape! Super cute. Hmm, I might need to rethink my non-turtles being not cute statement! I think in general, anything "mini" is the exception to the rule, especially concerning cuteness, hehe. I got my custard powder at a Chinese supermarket (it's a British/HK product). It isn't absolutely necessary though; it just adds a bit more flavor. Anonymous: Thank you! Sorry for the late reply. If you want, you can bake them ahead of time and pop them in the freezer when they're cooled. Then, when you want to serve them, take them out, let them defrost, and they'll be almost good as new. If it's only a few days, you could just place them in an airtight container and they'll remain pretty fresh for that time. Also, a question: when mixing the dough, I realised that the sugar crystals are pretty visible. I was using normal sugar; will there be a difference if I used castor sugar instead? kits-hiwatari: The sugar crystals will be visible before baking. Don't worry, normal sugar is just fine. They'll melt down when the dough is baked. These are SO adorable! I am trying them right now, but my dough seems too crumbly :( did I do something wrong? Can I add a bit of water to make it sticky? It's most likely that your butter wasn't soft enough before using it thus your dough ends up crumbly. Adding water won't really help as the texture after baking won't be very good. Next time make sure your butter is soft before using. I am going to make these for my daughter's baby shower. I want to make these 7 days in advance...what is the best way to keep them fresh? After the cookies cool, put them in an airtight container, wrap it in a freezer bag and place the container in the freezer. On the day of the shower or the night before, take them out from the freezer and let them defrost/return to room temperature before serving and they should be good as new. So I followed the directions except I used Imperial Baking Spread..which I guess it not real butter? and I accidentally melted it in the microwave when trying to soften it...When I finished making the dough it came out really sticky and so I added some more flour til it turned into a pliable consistency without too much stickyness. I tossed it in the freezer and finished everything the way directed and I ended up with adorable turtles....but they tasted icky. ))): Clearly I know nothing about baking. Please help! Well, you've already identified your biggest problem, not using real, room temperature butter! Rule #1 when it comes to baking is follow the recipe exactly as written (baking is chemistry and requires precision). Messing with the ingredients and changing the measurements is pretty much a guarantee that the final result will not turn out the way it was supposed to, whether in appearance or taste. If a recipe says to use butter, always use butter. Butter plays a large role in the final taste of the cookies, something that margarine can't replace IMO. When softening butter, if it melts (and you aren't supposed to use melted butter in the recipe), either try again with a different stick or refrigerate the melted butter until solid again. If the butter is melted, the dough will definitely be sticky. E-mail me if you have anymore questions! I'm happy to help. Hey I love these cookies! If I make them and they turn out well, can I post them on my social media? I'll be sure to credit them to your website :) Thanks!!!! For sure! And I hope your cookies turn out well 😊!